A few months ago, I caved: I bought myself a coloring book. And maybe you did, too, or perhaps you received one as a gift for the holidays. According to a recent Fortune article, adult coloring books are one of the biggest contributors to this year’s boost in print-book sales. With over 11,000 search results total, five of Amazon’s current top 15 best-selling books are coloring books. Indeed, many of my friends and family members sharing their new coloring loot on social media over the past few weeks told me that they are not the types of people who would typically consider themselves artistic, nor did they feel they had adequate time in their daily lives for lengthy creative pursuits. Coloring books, they agreed, are a convenient way to escape into their imaginations for just a few minutes or hours a day, time-permitting. Whether you would consider yourself artistic or not, research points to the importance of incorporating a little bit of creativity in our daily lives. In one study, Yale researcher Zorana Ivcevic examined traits associated with “everyday creativity” – how we express ourselves in everyday situations, including our personal style and devising ways to cope with daily challenges. Those who ranked highly in having an overall “creative lifestyle” tended to be more conscientious, as well as more likely to seek out personal growth. Yet more new research has focused on how creativity, especially in the form of visual art, can improve physical health. In a study of 30 women with disabling chronic illness, those who had taken up art described the hobby as “cathartic,” distracting their thoughts away from their pain and promoting feelings of “flow and spontaneity.” Research also suggests that engaging patients with art can shorten the length of hospital stays by reducing stress and anxiety. Of course, coloring within the lines compared to, say, painting a blank canvas is mostly simple decision-making — choosing which color goes best where, with relatively little skill involved. Our prefrontal cortex is responsible for coordinating thousands of decisions each day, from which socks we should wear to life-altering relationship and career choices. As an unconscious response to this so-called daily “decision fatigue,” making a series of small, inconsequential decisions (teal or mahogany for this squiggly line?) may give us a refreshing sense of self-control after a long day of big, important ones. I used every Copic I have on this two page spread in Lost Ocean! I colored it to use as a sort of color reference! It was so fun! Then there’s my other misgiving about the trend. I’m a busy person, and will be especially these next few months, as I’m finishing up my Ph.D. in neuroscience at Penn State College of Medicine. When I color, I’m not actually accomplishing anything productive; I may spend several meticulous hours on a single picture before simply shoving the book back onto my shelf. And then what am I supposed to do with it — tape it up on my fridge? My co-worker Carrie told me that she loves the grainy, newspapery feel of children’s coloring books against crayon when she colors with her son. The sensation incites a youthful feeling — she thinks she may prefer these books to those designed for adults. Kaufman’s descriptions of nostalgia may also explain why I found myself coloring along to ‘N Sync and the Spice Girls after my latest podcast episode had ended. 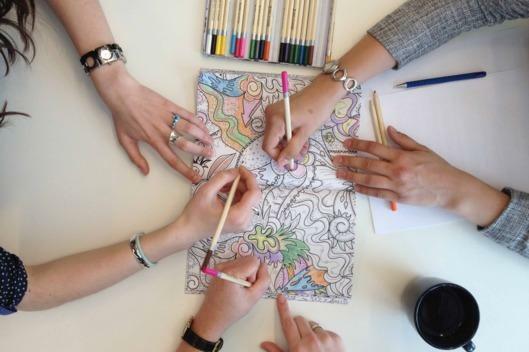 Coloring books are one of the trendiest hobbies among adults now, and yet another peg in the ever-evolving industry of self-help. They’re also a little bit silly. Even so, I think they might just be on to something. Jordan Gaines Lewis is a science writer and neuroscience Ph.D. student at Penn State College of Medicine.